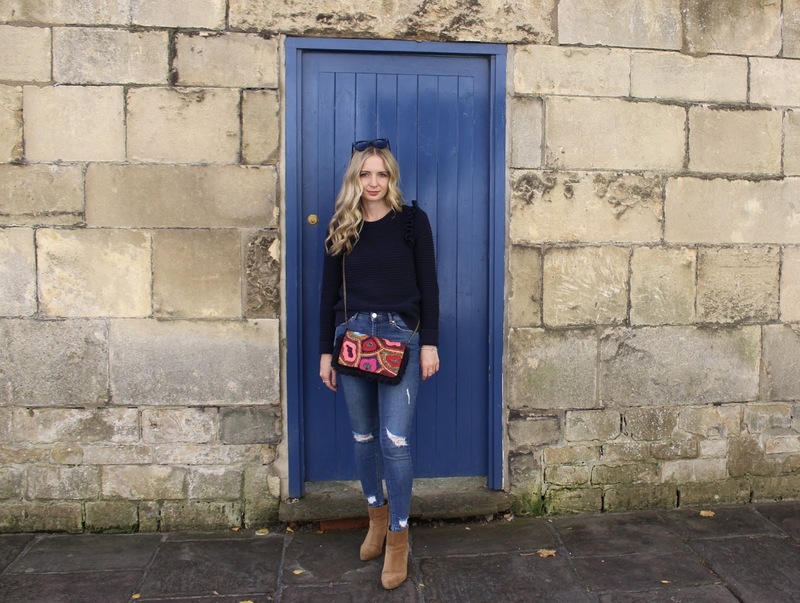 Whilst on a little day trip to Bath we decided to stop and take some outfit shots. A bit like London, Bath is certainly not short of lots of lovely looking houses or bright coloured doors! The ideal backdrop for a blogger. I'm definitely a bit of a comfort/ practical dresser. I HATE being cold and this means that lots of planning always goes into outfits before a day out. Layer upon layer (unless it's hot, obviously!). 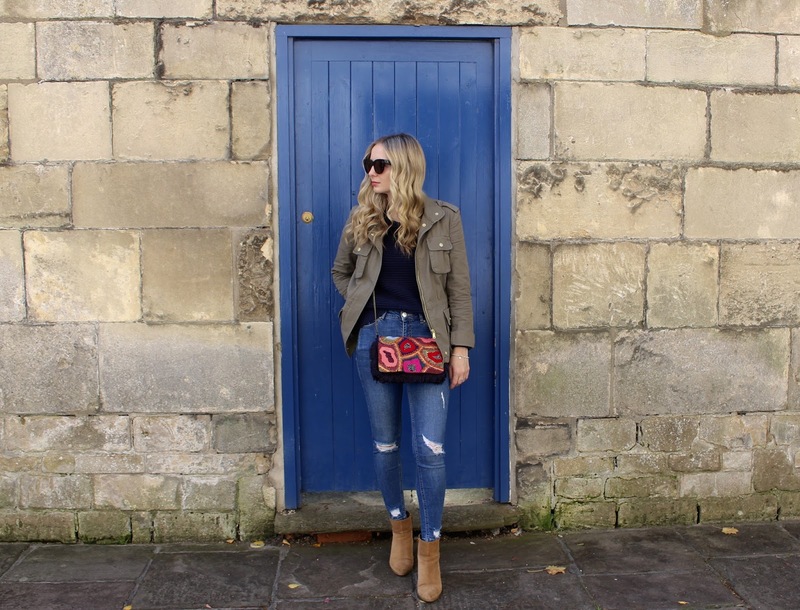 You would have seen this jacket featured in a previous post, it's one of those wardrobe additions which has been alternated between so many different outfits, I'm now wondering how I survived without it! It's the perfect season transitional jacket, not too heavy, but enough to keep you warm. Especially since the weather struggles to make it's mind up in this country. I'm just loving Khaki at the moment, it's a great colour and one that suits my pale skin tone. The rest of my outfit is what you call the bones of my wardrobe, jeans, a chunky knit and boots. Easy to put together and simple enough to let the accessories do the talking. The navy knit is Banana Republic and has seen me through several seasons now - even before the frill took over the highstreet. I love it when a classic item is given a bit of an update! These Nine West tan boots go with EVERYTHING and they are also super comfy - would recommend if you're on the look out for a pair. We have to talk about this gorgeous bag that I purchased in Malaga airport. You may have heard of a brand called Parfois. I love it, they have the most gorgeous jewellery and the nicest accessories. Funnily enough, I first came across the brand in Lisbon airport.. must have a thing about airports! As soon as I laid eyes on this bag I knew that my 'you're on the way home from holiday stop spending money' was going out the window immediately. Embroidery and the best selection of bright colours.. my idea of perfect. It certainly makes an outfit that bit more interesting!